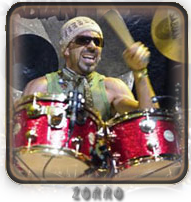 From the classic 60-70s rock he played with Lenny Kravitz to the old-school, R&B-meets-hip-hop beats from the Bobby Brown days, Zoro has always delivered the groove with maximum soul. Zoro wrote the popular "Commandments of R&B Drumming: A Comprehensive Guide to Soul, Funk & Hip-Hop" instructional DVD series, and the beats you find in DrumCore even reach back to funk s New Orleans roots. This pack is filled with a huge number of grooves that lend themselves to funk, R&B, hip-hop, and pop song styles. Studio ProFiles are recorded at 24-bit resolution directly into ProTools® HD using only top studio equipment such as Neve®, SSL®, API®, Manley®, Great River® and more. They deliver ready-to-use, album quality material and an authentic sound with outstanding character that is inspiring for many styles of music. This collection is the ideal writing and production tool for any musician and a great addition to Stylus RMX. To install your Stylus Expansion Grooves, just follow the instructions included into the READ ME. It is simple as drag and drop a folder in the correct Stylus installation folder and that s it!